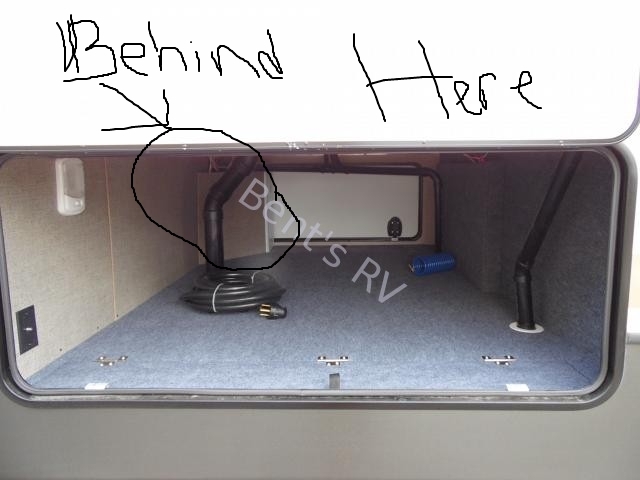 Does anyone know where the water heater bypass valve could be located on a 2014 Cougar 327RES? Thanks for everyone help in all the posts I have put up! I just looked at your floor plan. From the looks of where the HW heater exterior access panel is, it may be located behind an interior trim panel in the pantry cabinet left of the fridge. It will be below the shelving close to the floor. Look for square drive head screws that may be holding the panel in place. Hope this helps until someone else with your floor plan responds. It is right behind your outside shower, water hookup, battery disconect connections. You will see 1 screw there on the side in the "basement" and the panel will slide out and the back of the water heater is right there. The hot water bypass is exactly where KFXgreenie stated. Driver's side basement behind the outside shower hook ups. You need to remove the basement wall panel to access it. Terrible design. I purchased plastic access doors from Home Depot, traced the backing onto the basement wall panel, and then used a jigsaw to cut out the hole to fit the access door. A little sealant around the access door to secure it to the wall with a clamp and when it dried I put the wall back up. Easy access now. You'll probably want to do the same thing on the other side of the basement to have access to the water pump when your ready to winterize. If you need any pictures to look at, send me an email and I'll get them to you.